Scarcity of Resources is a great early game tempo hit vs resource reliant Runners. With many great resources out there right now, Scarcity can really put the runner in a hole while trying to set up. In comparison to Housekeeping, it has a slight edge: it effects every resource installed, not just the first. It loses vs Housekeeping, because Housekeeping affects any card type, and causes a discard - potentially more valuable than . This is where your decision comes in. If you're looking to crush the Runner financially, Scarcity of Resources may be for you. If you're looking to deck the Runner and lower their grip, Housekeeping is preferred. This card is amazing. I've been comboing it with News Hound in my Titan deck for some brutal rushes. At 0 influence how can you say no to this card? Put three in your deck and throw it down asap to ruin the runner's day. For most runners playing against this is like being thrown into a tar pit, but if you're playing a really resource heavy runner then you may as well flip the table over and walk away sobbing. Nothing is more deliciously evil than playing this on turn 1 and watching the runner panic if they can't get rid of it. 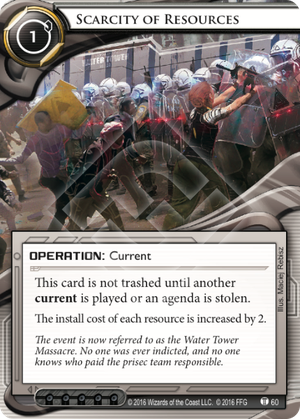 What a great card for crushing runner econ. Combined with the also new Financial Collapse the corp has a serious mad on for killing resources. This is going to put in a big push for event and click based econ. In specific terms looking at things like Hatchet Job, Fairchild 1.0 are going to kill off anything left behind or stick it back in your hand to force you to pay the cost again. Or you can go blanket econ kill and pair with things like Student Loans to really put a hurt on anything but hardware and program based econ.